Twelve teams from eight local schools will compete in the Scioto County District Mock Trial Competition, Jan. 26. More than 3,000 students will participate across the state. More than 3,000 high school students will enter courtrooms across the state on Friday, Jan. 26, to take part in the Ohio Center for Law-Related Education’s (OCLRE) 35th Annual Ohio Mock Trial Competition. The Scioto County District Competition is coordinated by the South Central Ohio Educational Service Center’s Gifted Coordinator, Sharee Price, along with Judge Howard H. Harcha, III. The District Competition will include 12 teams from eight schools including Ironton, St. Joseph, Notre Dame, Portsmouth, Portsmouth West, River Valley Bidwell, South Webster, Valley and Wheelersburg. In the 2018 case, students will tackle a case borrowed from the popular podcast, “Serial,” considering the post-conviction relief proceedings for a student who claims to have been wrongfully convicted of a 1998 crime he did not commit. Students must consider a defendant’s Sixth Amendment right to counsel, and what should happen when an attorney provides less than adequate assistance. Ohio Mock Trial district competitions will be hosted in 24 counties throughout Ohio and more than 1,000 legal professionals will serve as volunteer judges, competition coordinators and team advisors. Ohio Mock Trial is Ohio’s largest high school academic competition and among the largest high school mock trial programs in the nation. Teams that win both trials in the district competition will advance to regional competition on February 16. Regional winners will compete in the state competition on March 8-10 in Columbus. The 2018 State Champion team will represent Ohio at the National High School Mock Trial Championship in Reno, Nevada, May 10-13. Mock Trial events are open for the public to attend. The Scioto County District Competition is sponsored by American Legion James Dickey Post 23, DESCO Federal Credit Union, Mrs. Rosalee Greene, the Honorable Howard H. Harcha, III, Dr. Michael Martin, Portsmouth Bar Association, Portsmouth Rotary Club, the Scioto Foundation, and Southern Ohio Medical Center. 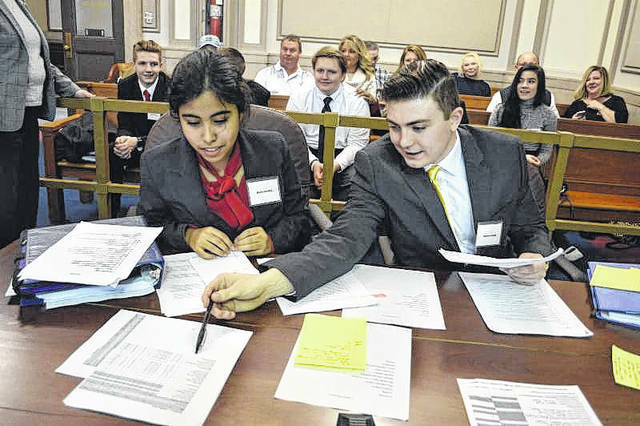 https://www.portsmouth-dailytimes.com/wp-content/uploads/sites/28/2018/01/web1_mock.jpgTwelve teams from eight local schools will compete in the Scioto County District Mock Trial Competition, Jan. 26. More than 3,000 students will participate across the state.